Products that require a license key, will ask for your license key when installing the software. 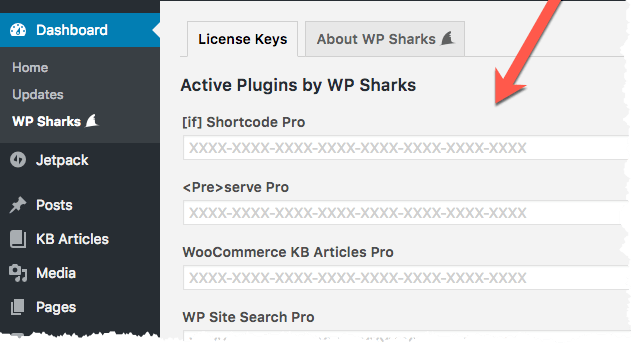 By entering your license key you will enable automatic updates for the associated WP Sharks plugin in WordPress. When you have one of our products installed, you can also navigate to DashboardWP Sharks, where you can activate/deactivate license keys for all themes/plugins developed by WP Sharks that are currently active in your WordPress installation — as seen in the following screenshot. Each license key is good for X number of sites (based on what you selected during checkout). To activate more than X number of sites, purchase the product again to receive an additional license key. Or, from the My Downloads page at wpsharks.com you can deactivate an existing license key, for a specific site, so you can use the license key again, for a new site; e.g., when moving from a development environment to a production server. Each license key is good for X number of years (based on what you selected during checkout). When access expires you may continue to use the software for as long as you like. Automatic updates & support will stop, but you can renew for just 30% of the original purchase. You'll be notified via email when it's time to renew. WP Sharks products integrate seamlessly with WordPress. You'll be notified about new releases of our software in the same way you are notified about updates for other WordPress plugins. And, just like WordPress itself, you can force a check for the latest updates by pressing this button your Dashboard. Automatic updates are also compatible with the following 3rd-party products. You can also update any WP Sharks plugin, just like you would any other WordPress plugin, via ManageWP. Just be sure that you've configured your WP Sharks license keys ahead of time so that update checks do occur as expected behind-the-scenes. You only need to enter your License Key once for each product when you first install it. You can also update any WP Sharks plugin, just like you would any other WordPress plugin, via InfiniteWP. Just be sure that you've configured your WP Sharks license keys ahead of time so that update checks do occur as expected behind-the-scenes. You only need to enter your License Key once for each product when you first install it. You can also update any WP Sharks plugin, just like you would any other WordPress plugin, via WP-CLI. Just be sure that you've configured your WP Sharks license keys ahead of time so that update checks do occur as expected behind-the-scenes. You only need to enter your License Key once for each product when you first install it.